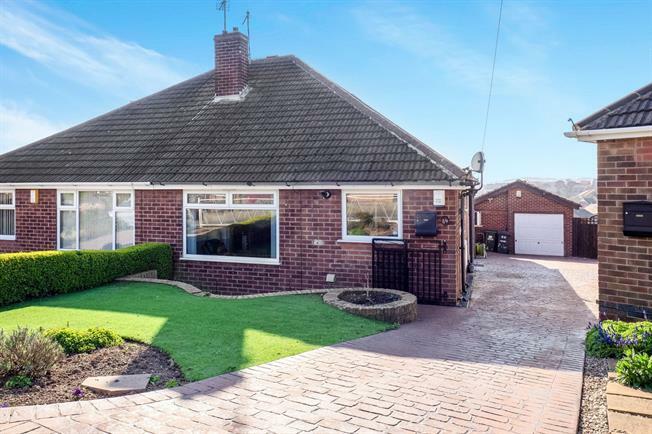 2 Bedroom Detached Bungalow For Sale in Nottingham for Asking Price £220,000. STUNNING VIEWS Two double bedroom, duplex bungalow. The property benefits from a landscaped garden, beautiful conservatory and superb location. Accommodation comprises; entrance hall, living room with arch leading through to the fully fitted kitchen, dining room with stairs leading down to the conservatory with tri-fold doors opening onto the landscaped garden with patio area, decking and flowers/trees. First double bedroom with built in storage cupboards. Stairs leading to second double bedroom with storage in the alcoves and views over Arnold. To the front is a small garden and shared driveway with a detached garage. A viewing is essential to appreciate the size and location of this unique bungalow! Double glazed uPVC windows facing the front and side. Tiled flooring, part tiled walls. Fitted wall and base units, stainless steel sink, integrated oven, integrated hob, over hob extractor. UPVC tri-fold double glazed door, opening onto the garden. Tiled flooring. Double glazed uPVC window facing the side. Carpeted flooring, tiled walls. Low level WC, corner shower, pedestal sink. Double glazed wood velux windows facing the rear and side. Carpeted flooring, built-in storage cupboard.